It’s true! You can become slender and healthy while enjoying pasta, chocolate, cheese, bread, and wine! Award-winning registered dietitian Layne Lieberman discovered that three European countries were leaders in longevity, with very low rates of heart disease, obesity, and diabetes. And yet, these countries–Italy, France, and Switzerland–boast some of the world’s most decadent foods. Layne traveled to Europe to learn firsthand just how these countries could combine superb food, a relaxed lifestyle, and exceptional health. Now, she shares her findings with readers who face the daily temptations of processed foods loaded with fat, sugar, and salt. To help readers avoid becoming part of the worldwide obesity epidemic, Layne has written Beyond the Mediterranean Diet: European Secrets Of The Super-Healthy. In it, she reveals how to make Europe’s health secrets work for you–wherever you live! For everyone who has ever said, “I want to be slim and healthy again”–without giving up the pleasures of delicious food–this book shows how to make their wishes come true! Layne Lieberman, MS, RD, CDN, is an award-winning registered dietitian and member of the Academy of Nutrition and Dietetics. She is a consumer advocate and innovator in the food, supermarket, restaurant and health industries. For 20 years, Layne has been a pioneering nutritionist guiding conventional supermarkets into selling organic and natural foods as mainstream offerings. Recently, she spent two years abroad to study food, health and the dietary habits of other countries. Collaborating with European chefs and locals, Layne discovered a way to prevent obesity and boost health without giving up the pleasure of enjoying the finest food. Layne holds a Bachelor of Science degree in Nutritional Biochemistry form Cornell University and a Master of Science degree in Clinical Nutrition from New York University. She completed both an internship and fellowship at the Albert Einstein College of Medicine, and trained at the Culinary Institute of America. “Layne has been a pioneering nutritionist supporting the organic and natural foods movement since the 80s.” Irwin Simon, Founder, Chairman and CEO of The Hain Celestial Group, Inc. Cheese, chocolate and wine do have a place in a healthy lifestyle—that’s what this debut author and registered dietitian says we can learn from Europe’s longest-lived populations. For decades, Americans looked to the traditional diets of people living around the Mediterranean as a model for healthy living—maybe not following that model but definitely chattering about it in books and media coverage. Lieberman, who spent two years living in Geneva, writes that there are plenty of lessons to be learned from other countries in Europe. Switzerland, Italy and France have some of the longest average life spans in the world, as well as low rates of obesity, heart disease and other markers of ill health. The book examines each country one by one and lays out the government’s official dietary recommendations, akin to the U.S. food pyramid, along with detailed descriptions of a typical day in the eating life of its citizens. Much of Lieberman’s background and advice will be familiar to anyone paying attention to the news: Americans are fat and getting fatter; we’re among the fattest people in the world; we eat a diet far too high in processed foods, sugar and fat; we snack too much and generally consume far too many calories. But Lieberman’s descriptions of the daily eating habits of her chosen European countries are downright inspiring: Lives marked by pleasurable outdoor exercise; a focus on local, organic foods so satisfying that they discourage overindulgence; regular leisurely sit-down meals that trump Americans’ predilection for on-the-go snacking; and, of course, daily indulgences in delicate portions (a square of good dark chocolate, a scoop of gelato, a single biscotto alongside a cup of coffee). It all sounds too romantic to be true, but Lieberman has lived it and brings an infectious enthusiasm to her writing. She concludes each chapter with a list of actionable tips for a European makeover of stateside eating habits and concludes the book with 70 pages of simple recipes, heavy on the whole grains, veggies and lean meats. Layne Lieberman is a self-proclaimed food lover and an RD with more than 20 years of experience in the supermarket industry. Her book, Beyond The Mediterranean Diet, is a refreshing read with the overarching message that adopting a health-promoting lifestyle can be delicious and enjoyable. Beyond The Mediterranean Diet is divided into three sections. The first outlines the lifestyle and dietary practices the author observed in Switzerland, Italy and France—three countries with impressive health statistics—during her two years as an expatriate in Europe. This section review show cultural foods, such as chocolate, pasta, and cheese, can be woven into a healthful eating plan. It was interesting to learn about each culture’s food preferences, its national dietary guidelines, and myths and facts surrounding each nation’s food culture. In the second section, the reader learns how to apply the Swiss, Italian,and French dietary practices to life in the United States. Particular emphasis is placed on portion size. The reader is encouraged to follow Europeans’ lead and use “Super-Healthy Plates,” or dishes that are 9inches in diameter, as well as smaller utensils. I particularly enjoyed the segment that out-lines principles that encourage Americans to change the way they view food and mealtime to reflect a more European perspective. This includes paying more attention to hunger cues, turning off electronics and instead socializing during mealtime, and going for a walk before and after dinner. It’s simple advice,but the tips reinforce the idea that food is meant to be enjoyed. 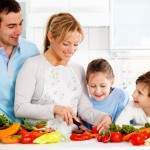 Additional advice for food shopping and dining out also is provided, with an emphasis on turning to whole foods and purchasing local, seasonal foods when possible. The last section is dedicated to Mediterranean-inspired recipes that are relatively simple, unintimidating and made with wholesome ingredients. I loved creating and tasting the Bircher Muesli and the Lentils, RoastedBeets, and Tabouleh Over Arugula. I truly enjoyed this book. It not only advocates for RDs but also promotes sustainable habits, overall well-being, and the importance of enjoying good food. —McKenzie Hall, RD, is a cofounder of NourishRDs, a nutrition communications and consulting business based in LosAngeles. This review first appeared in Today’s Dietitian, The Magazine for Nutrition Professionals, Vol. 16, No. 6, June 2014. This book is a must read. As much as I do know about eating healthy , I still found this book informative and interesting. I found myself fantasizing about eating amazing breads abroad! Layne Lieberman’s book “Beyond the Mediterranean Diet” is full of stunning photographs, practical advice and delectable recipes. It is extremely informative about the importance of really knowing your ingredients and being aware of everything you put into your body. Lieberman inspires you to adapt the european style of eating and provides you with the tools necessary to do it successfully. Thank you Layne for this magnificent book so full of the most interesting information. There are not many people who know more than you about how to take care of ourselve while enjoying life and good food at the same time. That is quite a feat! It is fun to compare the European habits with our American ways of life. The photos and récipes are wonderful. A wonderful, sensible book filled with delicious recipes and artful photographs – a must read! Layne Lieberman takes the reader beyond the Mediterranean Diet and examines the lifestyle and dietary choices of the three european countries with the longest longevity rates. This approach easily applies to a fast paced lifestyle, making it easier to stick with a practical diet and make healthful choices. Her writing is fluid, engaging, and eye-opening, all accompanied by the most scrumptious recipes and beautiful photographs. The recipes are easy to prepare, quick and delicious. I highly recommend the turkey meatballs. They were a crowd pleaser in my household! Layne Lieberman nails it! As an avid traveler myself, having been to over 70 countries, Layne really captures why we should look to Europe to make changes to our diets. Written beautifully with stunning photography, Layne teaches us really do able things we can right here in the good old USA so we may too strive for the excellent health stats of Italy, France and Switzerland! Her book are not mere words, but words to get us into action with her helpful step by step instructions. Layne takes all of her experience as an RD and turns it into a gorgeous book that goes way beyond the standard advice. The recipes are a delightful bonus! I love this book and you will too! Layne Lieberman’s advice is a sterling example of how to battle the stereotypical ‘American Diet’. She praises quality ingredients while denouncing the notion of ‘more is better’ and large portions. She offers a catalog of ideas and methods to retrain your brain and body, allowing yourself to break free from the ‘eat large’ mindset. Beyond the Mediterranean Diet was more than a cook book, it was an exploration of cultural and culinary differences. As a health conscience individual, I recommend this book as a trustworthy guide to healthier living. Growing up, my mother constantly argued against the use of antibiotics and other “additives” in food. She told me that food had always tasted better when she was young, growing up on a farm. It was always her opinion that the downward slide in quality was attributed to the prominent use of food additives. So, at an early age, I became skeptical of any foods with additives—what Layne refers to as “ingredients you can’t pronounce”—and learned to avoid them like the plague. The advice provided by Lieberman falls in accordance with my that given to me by my own mother. The difference is, Layne supports her arguments with facts and reputable knowledge, while my mother simply pokes me with until fork until she’s convinced I’m listening. Lieberman’s book ‘Beyond the Mediterranean Diet’ didn’t offer advice I couldn’t find somewhere else—it just offered it in the clearest, most supportive way. And let’s not forget that it’s a cook book! It’s full of knowledge, history, and amazing recipes! I would certainly recommend this book to any who are seeking a healthier, happier diet. The book is wonderfully laid-out with smart observations and filled with important information and tips. The recipes look straight forward and delicious…can’t wait to try! I really like this book by Layne Lieberman. It is a wonderful resource for dining at home, at favorite restaurants or trying new places. She includes 50 delicious and nutritious recipes that are simple enough to accomplish for family and friends. I enjoyed the photos of places she has toured along with photos of the people she interviewed in her travels and research for this fabulous book. As a Registered Dietitian, she provided important information to me that I never knew about in maintaining good health. Her book is very encouraging and easy to follow. I certainly recommend it highly. Ms. Lieberman is an internationally recognized nutrition expert and I follow her website. This book has great info – accessible, approachable and includes delicous recipes for the home cook. There is a lot of content on nutrition – a culmination of the author’s travel and educational expertise. I think the book could help you create a long-term healthy lifestyle – filled with joie de vivre! Beyond the Mediterranean Diet: Layne Lieberman, M.S, R.D, C.D.N is a pioneer and expert in the field of nutrition. While living in Europe for a couple of years, she researched extensively the intricacies of diets in countries with the lowest obesity and mortality rates. This book covers the evolution of the American diet (specifically portion sizes) and offers simple solutions for weight management. In addition to breaking down the Mediterranean diet and indigenous eating habits across different regions of Europe, Layne’s book includes amazing healthy recipes all of which have been tested. Bonus: Layne herself has taken all of the photos included in the book. This book is engaging, useful, practical and authentic. Award-winning registered dietitian Layne Lieberman discovered that three European countries were leaders in longevity, with very low rates of heart disease, obesity and diabetes. And yet, these countries — Italy, France and Switzerland — boast some of the world’s most decadent foods. Layne Lieberman is extraordinarily well qualified to write this book, which, if fully understood and followed, will undoubtedly add years to your life. The fact is: Dieting doesn’t work. Changing ones eating habits to fresh foods and away from packaged foods is the key to health and wellness. This book will show you how to make these changes and will explain in simple language why making these changes will change your life. It even provides easy to follow recipes that are truly yummy! Kudos! Beyond the Mediterranean Diet is a bible teaching you to live and eat healthy! Layne’s passion for nutrition and food and travel provides the path to eating the foods you love without the guilt. Well worth the read and the recipes! Hi Layne – I have been using your book while attending my weight watchers meetings and I have been losing weight and am almost to goal – just 5 pounds shy- and I seem to have more energy – I still eat meat but have been focusing on fresh foods and do have my goat milk even though it has more fat I feel this pastured raised goat milk is healthy and I make my own yogurt/cheese- I would hate to throw it out- I just cut down on meat- balance, no? Layne Lieberman’s book Beyond The Mediterranean Diet is very well explained, scientifically based and flexible nutrition plan which includes vegetarian and ethnic options. Even if you choose to not follow recipes, you will be left understanding the dangers of other diets. Is intriguing to read because it provides a lot of history about the Mediterranean and Swiss way of eating. I enjoyed the pictures and I have tried a few of the recipes, and I love the taste. If you’re looking to start a whole new meal regimen with outstanding health results, pick up this powerhouse read and direct your health in a positive direction. In closing, I must also disclose that I am a chef and restaurants owner and I have cooked for 30 years. Son livre ‘Beyond The Mediterranean Diet’ est une très belle découverte, comme Layne. C’est le livre de chevet de notre studio de Yoga! I heard your presentation and bought your book at Changes in Latitude and love it. I was just planning a lunch and am going to make a recipe or two from your book. I have a recollection of a French recipe from many years ago that I think was a meringue shell with a chestnut paste in the shell and maybe whipped cream or ice cream on top. Would you have a recipe for a dessert that is like it or similar to it? I thought it was called Meringue Glace, but the recipes for Meringue Glace that I have found on the internet are not the same as I remember it. After your talk at CIL, we talked about the movie A Year in Burgundy that can be streamed on Netflix. Did you have a chance to see it? I’ve always wanted to explore European cuisine, even better if they can help me lose the weight! The recipes look so enticing! I can’t wait to try them out! This evenings #PromoteOthers spotlight goes to…..Layne Lieberman RD! Layne is a registered dietitian and author of the stunningly beautiful book Beyond The Mediterranean Diet(http://amzn.to/164bgTp). After an extremely successful career as a supermarket dietitian with media credits that will make your head spin, Layne embarked on a few years journey thru Europe to write and research her must- have nutrition book. And what I love most about Layne are her highest of standards to produce her book the way SHE wanted it-it’s probably the MOST successful example of self publishing I’ve ever seen- she kicked some you know what! And her commitment to organics and sustainability is a daily inspiration to me. I’ve been looking for a great holiday gift for my mum who loves to cook, this may just be THE gift! Excellent book I highly recommend it. Thank you Layne Lieberman for writing a beautiful book that includes important information on living a healthy lifestyle. The recipes are delicious and so easy to follow. Layne Lieberman is a miracle!!! Layne totally gets it! She truly understands everyone loses weight in different ways. Layne also understands what foods work for you and what foods don’t. I had stomach aches for years and I had no idea it was from what I was eating. The book is amazing and so is Layne. Insightful and informative with great recipes! If you were to travel the globe in search of the culinary and nutritional secrets of various cultures and put it all into one book, this is what it would look like. Beyond the Mediterranean Diet shows you how our society has created eating habits that are based more on corporate profit than whole or even “real food” ingredients. Learn from those in this world who give thought and take pride in what goes into their food for every meal. Learn from Layne Lieberman. The recipes are all you need to get started on a delicious and healthier lifestyle that will change the way you feel and look at food. My personal favorite is the chocolate tofu mousse! Beyond The Mediterranean Diet is a fabulous book that helps health conscious people like myself eat healthy while still enjoying yummy foods! The recipes are delicious (trust me I’ve tried them!) and so simple to make! Great read! Love this book and a must buy!!! I love this book a lot…It tells you a lot on how to dine out and how to cook at home and eat clean and healthy. Being a vegeterian its hard to find right amount of protein and clean eating, however, this book explains a lot on how to eat clean and eat right portions. Love it. Enjoying this insightful book on European gastronomy for health + food enjoyment. This book is beautifully written and photographed by Layne Lieberman RD. The recipes are easy to follow and will put you to vibrant health. 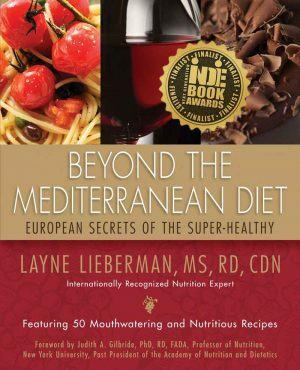 In her book, Beyond the Mediterranean Diet, Layne Lieberman shares the “European secrets” for health in an easy to read book with beautiful photography. Ms. Lieberman obviously conducted first hand research as she explored the diets and foods of the Swiss, Italian and French and compared it to the American style of eating. The book offers a wealth of nutrition information with practical suggestions, including recipes, for the reader to incorporate a healthy European style of eating. A high quality paperback book worthy of any coffee table that will entice a guest to pick it up. In an age where we are inundated with a new fad diet almost weekly, Beyond the Mediterranean Diet, is a refreshing change. Layne Lieberman explores the diets of three countries – Switzerland, France and Italy – to explore the interconnection between the longevity rates enjoyed in these countries with their diets and healthier lifestyles all in an effort to teach us about lowering high cholesterol rates and obesity that plague us in the United States. Not only do we value the “Big Meal” concept in the US but our food is laden with chemicals, additives and preservatives that have not been properly tested by the Food and Drug Administration. Layne’s personal experience living in Switzerland coupled with the bright and colorful photographs throughout the book make it an enjoyable read akin to a memoir and not just a “diet book” full of dos and don’ts. Yes, Layne gives guidance and direction and her history in the food industry gives her particular insight into what is really in the food we eat, even the food packaged and labeled as “healthy”. Layne gives us compelling reasons for why we need to change what we eat, how we eat, and most importantly, our attitude towards food. Layne goes further and provides us with suggestions for customizing a diet that is healthy as well as dealing with the emotional landmines and pitfalls that may pop up along the way. There are times when I question how we might stick to this and then she reminds of the benefits and I feel inspired again. She also realizes that we are human with emotional ties to food. I would highly recommend this book to anyone who wants to learn more about what we ingest on a daily basis and living a healthier life. Wow! This book was amazing! I loved reading about the different countries and the way they eat. I loved hearing Layne’s experiences with the different cultures. The recipes look amazing! I can’t wait to try them. I was truly inspired by Laynes lifestyle and her nutrition idea. Everyone should keep a copy of this book in their kitchen to help them maintain a healthy balanced lifestyle! Can’t wait to share this book with my friends! To all of my Facebook friends……Just read “Beyond the Mediterranean Diet” by my friend Layne Lieberman RD! Everyone who knows me knows that I am very conscious about what I eat and don’t eat! I loved this book! She shares my passion about importance of living a “healthy lifestyle”! My rheumatologist recommended that I read this book to get back on track with a healthy diet. Beyond The Mediterranean Diet is packed with science based nutrition and the most up-to-date advice on how to achieve a healthy lifestyle. It offers a wealth of information about eating out, cooking, food shopping and meal planning. The recipe section shows you how to plate your meals and gives you easy options for every meal of the day, snacks and healthy deserts. The photos are spectacular , which makes it a perfect coffee table book that’s also useful! It’s a perfect gift for health-conscious foodies or wannabes! Disclosure: Nutrition411 receives no monetary compensation for product reviews. The reviewer received an editorial review copy and was compensated by Nutrition411 to write this post. Thoughts and opinions expressed are the reviewer’s own. Three European countries—Switzerland, Italy, and France—are worldwide leaders in longevity with very low rates of heart disease, obesity, and diabetes. Yet, these countries are known to serve some of the world’s most decadent foods. In this book, author and culinary nutritionist Layne Lieberman, MS, RDN, CDN, sets out to reveal how readers can make Europe’s health secrets work for them and avoid becoming part of the obesity epidemic. She states, “It’s true! 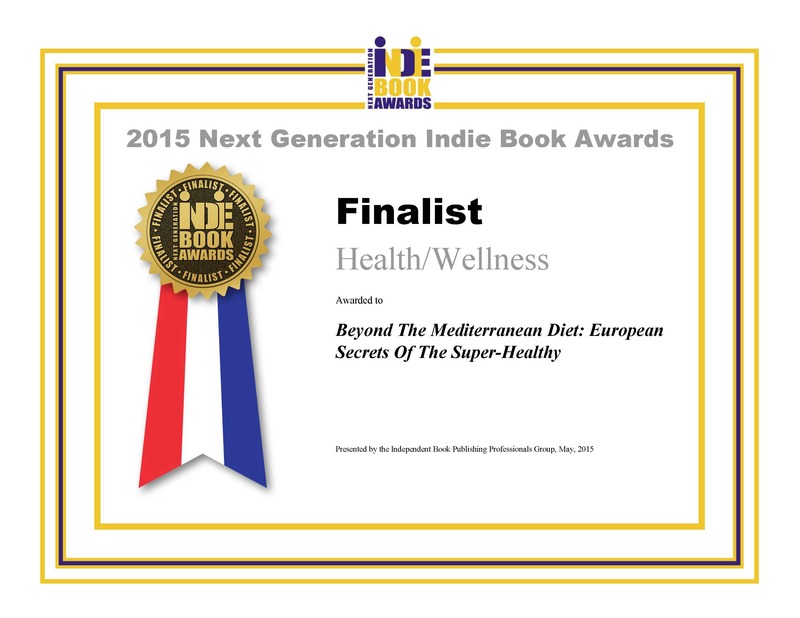 You can become slender and healthy while enjoying pasta, chocolate, cheese, bread, and wine.” Beyond the Mediterranean Diet was a finalist in the Health/Wellness category of the 2015 Next Generation Indie Book Awards. Beyond the Mediterranean Diet is divided into three main parts. Part one provides an introduction to Europe’s three healthiest countries with three subsequent chapters with summary checklists dedicated to the secrets attributed to the Swiss, Italian, and French diets. Part two explains what to expect beyond the Mediterranean diet including specific tips that will show you how to: reduce portion sizes, change your attitude toward food, shop for food the European way, and dine out boldly. Finally, part three provides 50 recipes for guilt-free indulgence that are categorized into three main meals, snacks and hors d-oeuvres, as well as desserts and fabulous finales. This book points to a lifestyle that emphasizes a combination of balanced eating and healthful lifestyle habits needed to achieve optimal health and longevity. Readers are encouraged to adopt habits such as: listen respectfully to hunger cues, merge freshness with convenience, turn off electronics, and find ways to be active throughout the day. The bottom line? Delicious, high quality (not quantity) foods are meant to be enjoyed in moderate portions in the company of others. This softcover book retails for $29.95 and can be purchased on Amazon. If you decide to use this book, please share your experience. Comment below, tag us on Facebook, or tweet us using #N411Reviews and @Nutrition411com. This book is fantastic. Recipes are easy to follow. This book is fantastic. Recipes are easy to follow, and I particularly like that they generally require a minimal amount of ingredients. Also, the flax seed pancakes are superb! Great book. Excellent info and amazing recipes for healthy food! This book is amazing! I especially love the recipes in it. Especially helpful for those that already love European cuisine, this just expands the palette. Bircher Muesli- it’s what’s for breakfast- so delicious! Finally starting the day right. Love this cookbook! Many recipes are gluten free and easy to make. Have had good results with all that I have tried so far. Amazed how good things are without the added sugar! Nutritional info is given. Text on French, Swiss, Italian ways of approaching food and cooking is helpful with many hidden tips on shopping. Have also looked at Med. diet cookbooks which are more complete with full range of pasta, meat dishes, sauces, etc. ; however, this is limited and arranges recipes by meal. Perfect for a single person or someone cooking for two. This book has been so incredibly eye-opening! I come from a family with notoriously poor health and I have no desire to follow in their footsteps. I owe it to myself, and my daughter, to live a long and healthy life and I’m so grateful that the author has shared her knowledge and research for everyone to read. She went to great lengths to make sure the information she is providing is relevant and accurate and it shows.